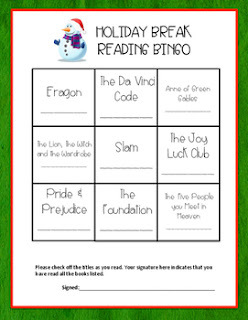 Here's a great freebie to encourage holiday reading! Use these fun bingo cards to challenge your students to read more over the holiday season. Pick a fun prize (A Get-out-of-homework Free Card, Chocolate Bar, etc.) and pass out the Bingo cards the last day before break. Then let your students surprise you with how much they read! There are a variety of cards – pick the ones that you think will work best for your students. Some have specific titles (at varying levels of difficulty) and others stick to general genres and ideas for getting recommendations. You may wish to pick two cards you think would appeal to your students and photocopy them on the front and back of a sheet, giving them more options. Let students know they just have to complete a row, column, or diagonal to win a prize. But you might want to offer a special grand prize if they can fill in the whole card! They just might do it. Looking for more great Christmas items? Check out all my Creative Holiday Resources.